Featuring an only slightly cut-down GK104 GPU compared to the top-end GTX 680, we were big fans of the GTX 670 when it first tipped up. It was only a little slower than the top GeForce card and was much cheaper. It also had a performance lead on the HD 7950 and was on par with the original HD 7970. Time hasn't been kind to the GTX 670 though and with prices staying relatively high since launch, its relevance has diminished. 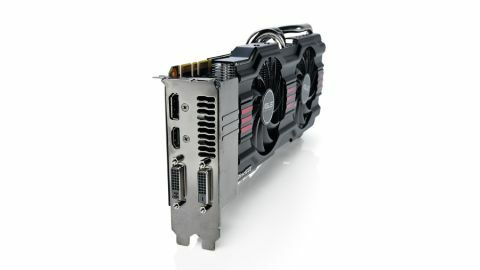 The new GHz Edition of the HD 7970 put it out in front of both top Kepler cards and the Catalyst driver optimisations, and more compute-oriented game engines have made the HD 7950 a rather tantalising prospect in comparison. The part of the rival AMD GPU is played here by another Asus card and is significantly cheaper than the GTX 670, now trading performance leads across our benchmarking suite. At about £50 cheaper for the same sort of performance, itfs a tough ask for this second-tier Kepler card. That said it's more than capable of delivering great fps scores at high-resolutions, so there's no reason to be down on it if youfve got one sat in your machine. I'm still more than happy with mine. But, it's tough to recommend the GTX 670 to anyone looking to spend decent money on a graphics card. The HD 7950 will deliver the same sort of performance, in some cases significantly more, for fair amount less cash. It's still got some impressive overclocking chops, but box-fresh the AMD card wins out in this too.